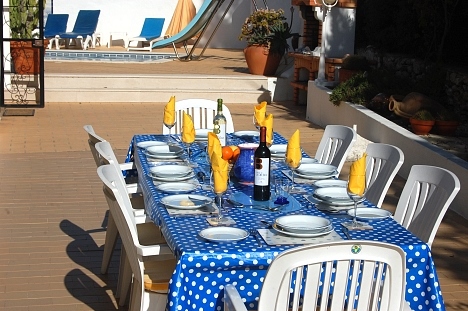 Casa Rostra is a charming 4 bedroom villa, 3 bathrooms with secluded swimming pool, numerous terraces located in a quiet and peaceful cul-de-sac, just 300m from Centianes beach and close to an Italian restaurant. This property is a hidden gem for a group of friends or two families with 2 wings of 2 twin bedrooms joined by a very spacious lounge and dining area. Casa Rostra has 4 twin bedrooms and 3 bath/shower rooms. Each wing of the villa has 2 twin bedrooms, 1 wing has one twin bedroom with an en suite shower room and shares another bathroom (shower over the bath) with the second twin bedroom. 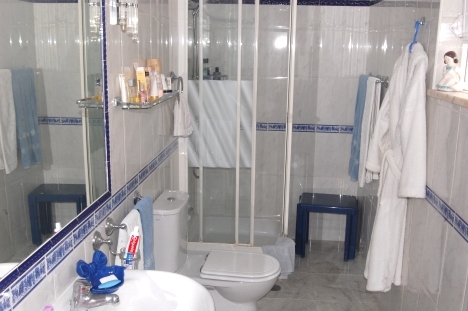 On the otherside of the living area are 2 twin bedrooms sharing a shower room. All the bedrooms have air conditioning. Outside the property is set in a good sized plot, fully fenced and gated, with mature gardens, with seasonal fruits and vegetables available for the guests. The property has good seaviews to the south and partial sea views to west (great for watching the sunset) from the the large roof terrace. There are extensive terraces that wrap around the villa, offering lots of different place to sit and enjoy a drink and food. There is also a small lawn area for the little ones to enjoy. To the rear of the property and outside the kitchen is a large table and chairs so all the family can share the main meals together. This is close to the BBQ area and at night time it is well illuminated with plenty of outdoor lights. Casa Rostra has a secluded and well sheltered 8m by 4m pool (1m to 2m depths) with roman steps, sun loungers for 8 and a waterslide (to be used at own risk). Furthermore, there is a shaded terrace with table and chairs for a spot of lunch. 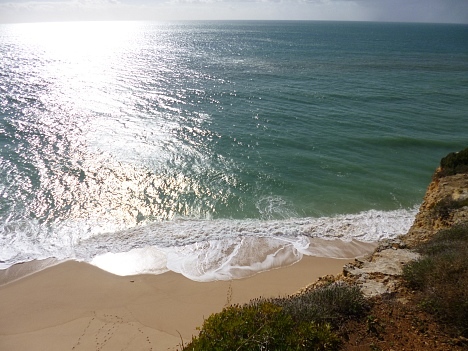 Casa Rostra is about 1.7km to the east of Carvoeiro and is just 300m from a lovely sandy beach, a couple of minutes walk from the nearest restaurant (take away available) and within a 5-10 minute walk there are another 3 restaurants. Carvoeiro with its shops, restaurants, bars and beach is about a 20 minute walk or around a 5 euro taxi fare. If you are keen on your sports, the 2 closest hotels allow clients to hire their tennis courts. Vale de Mihlo 9 hole golf course is about 20 mins walk, along with Rocha Brava and its tennis club. There area a number of championship golf courses within a 10 minute drive. Before you reach Carvoeiro, there is the Tivoli with its SCUBA diving school, based at Vale Covo beach. If you refer to the villa book there is a guide to lots more to do in the Algarve and contacts with a local transfer and tour company to offer you tickets and transport. "We really enjoyed our visit to Carvoeiro. It is a large village with loads of character and friendly people. The coastline is beautiful. The villa was just what we wanted because it was very spacious and peaceful but also very 3 minutes walk to a gorgeous sandy beach. Carvoeiro village has lots of bars and good restaurants for a night out and although we didn't have a car, we could walk in easily and then get get a taxi back at night. The swimming pool was not overlooked by anyone and at night was all lit up. We walked along the cliffs to the next beaches along the coast and also played tennis at the nearby hotel. We really liked the Italian restaurant close to the villa on the way to the beach -they do good takeaways as well.